I was at our neighborhood coffee shop yesterday morning. I woke up a just a tiny bit earlier so I could sneak a solo coffee before I went to market. Which I suppose is a funny thing to do on Valentines, but I love it when I have time to grab a cup of coffee before heading to the market on Saturdays, so there you go. Just me, my flat white, doing my little (and I do mean little) market list, and watching my neighbors. A little bit of calm before the weekend bursts upon us. I sat there, like I have done many Saturdays before, sipping my coffee, looking around. I let everything wash over me. The deep comforting smell of the coffee, the way the cup’s fat lip touched mine, the multitude of conversations happening all around me, the soft green of the succulents they like to put on every table. And I felt a kinship with everyone there, although they were all strangers. Does that sound odd? You know those times when you think the human race is going to hell in a handbasket? Well, this was the complete opposite of that feeling. I felt like, at that moment, I was connected to everyone. And they to me. That we were all trying to be humans together. The breathless and hopeful and tenuous and fleeting beauty of it. At that moment, I loved everyone in that coffee shop. The old man in the maroon felt fedora, smoking a cigar and holding his cane and looking like he had a million mysteries running through him. The group of three in the table in front of me, two foreigners and one local, talking about UNESCO heritage sites and other such important matters. The young family with their baby in a stroller, an iPad propped up so he (or she) could watch Hi5 while they had their breakfast, making me feel (gratefully) less guilty about my own loose protocols on TV and gadgets. The couple on my right, older, all briskness and business, their formality hiding a fondness and familiarity, that I felt anyway, even through the way he said “let’s have the French toast stuffed with dark chocolate” as if he was conveying the bottom line of a financial statement. The couple on my left, younger, who held hands across the table and would not let go, through earnest conversation topics, shifting of positions, and ordering of coffee their hands linked, stretched and knotted but wouldn’t break – that day they did not seem trite or corny, but reassuringly endearing, so much so that when their order came and their hands parted I almost felt the pain of it. Even the waitress across the room, who seemed to understand what I needed with just a softly mouthed “water” from a distance, her lips echoing “water” before coming over with a tall bottle to refill my waiting glass. Glorious humanity. I felt you. I felt the goodness. This has nothing to do with noodles, except that noodles too are good, and sometimes glorious. – Prepare noodles as per package instructions. Rinse in cold water and set aside. 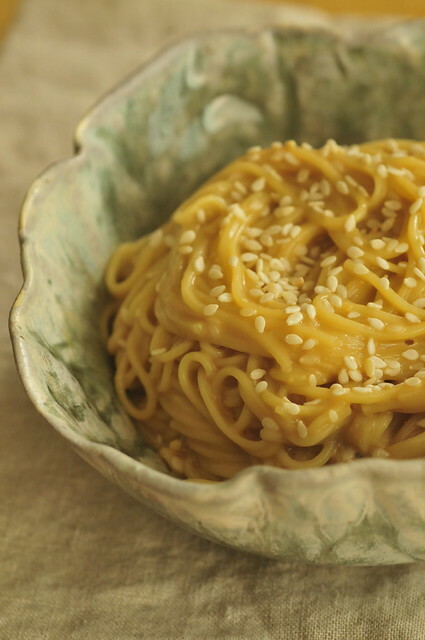 – In a small bowl whisk together thoroughly the peanut butter, sesame oil, soy sauce, chili oil, honey, 1 tablespoon sesame seeds, and the pasta water. Taste and adjust – if you want it to be saltier add a little soy sauce, if you want it to be sweeter add a little honey, if you want more heat add more chili oil. You are looking for a balanced flavor. – Toss the noodles and sauce together. Garnish with the remaining sesame seeds before serving. I had been sitting on this recipe for a while now. It’s been hanging around my pinterest board for a bit. 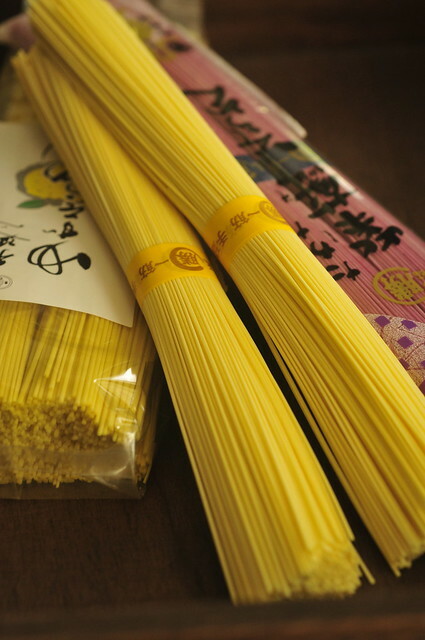 I have also had these lovely somen noodles that I procured on a trip to Hong Kong, and had been meaning to use. So it made sense to pair one with the other. I decided to use the egg somen (the others in the photo are perilla and yuzu…I can’t wait!) because I felt this creamy nutty sauce would go well with it, which it did. 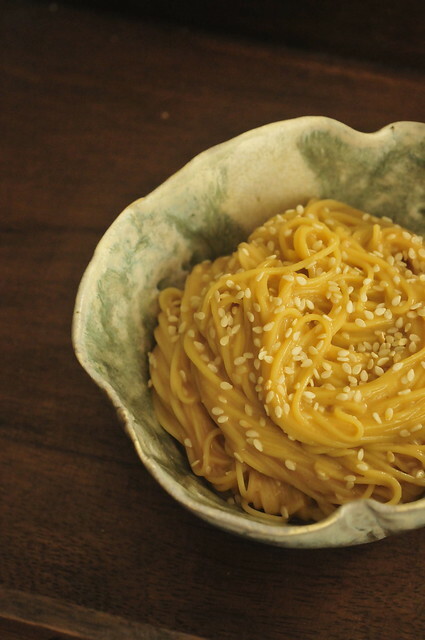 I’m thinking of trying this with the original soba called for though as the somen is quite thin and delicate and this sauce could do with a more substantial noodle. Although somen is still absolutely fine if that’s all you’ve got. This will make two servings, which is exactly right for us as it was a hit with half of the family, myself and the little boy, while C and the little girl weren’t quite as sold. Knowing my propensity for creamy dishes, and C’s typical indifference to them, I am not surprised. It is interesting though to see our little ones develop their own personal tastes, and to whom one will be similar. If you like Asian-style peanut sauce, and creamy sauces in general, you will like this as well I suspect. Add as little or as much chili as you’d like. I added about half a teaspoon and this was fine with my almost-two-year-old. I walk home from the coffee shop and market yesterday reinvigorated and primed to make the most of the weekend. Sometimes all you need is a quick reboot, nothing fancy or involved, just a little exhale over some coffee, short unplugged moments taking it all in, at your favorite neighborhood haunt. Hope you all had a wonderful Valentines weekend, spent loving everyone who you love most, including yourself! I loved this post, Joey. Serenity in what is otherwise a (to me) crassly commercialized holiday. This is a simple and tasty noodle recipe. There really is something about sipping your coffee quietly before life get busy in the morning. Hi Peachy! Yes, I love that moment of quietly sipping my coffee before the day gets crazy 🙂 One of my favorite moments of the day!